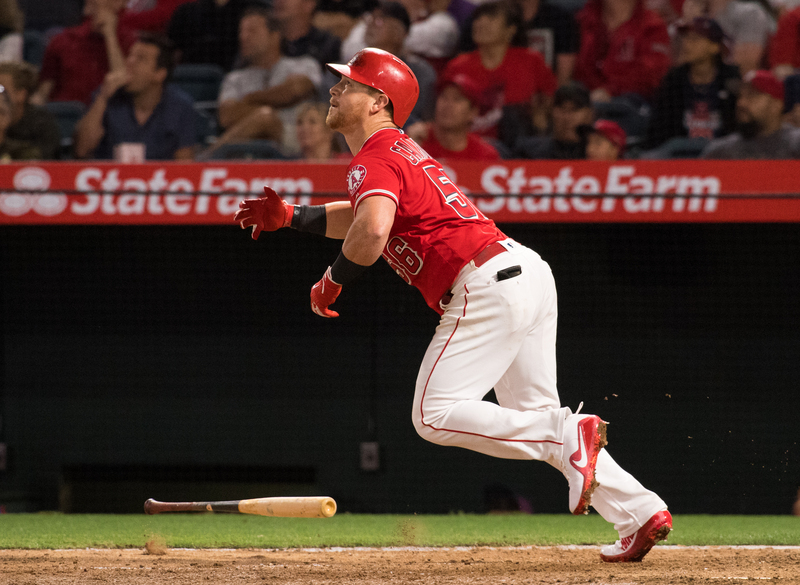 KOLE CALHOUN homered in the Angels’ 5-4 win over the Diamondbacks on Tuesday (Angels photo). The bullpen wasn’t perfect – again –­ and the run production was barely enough, but it all still added up to a 5-4 victory for the Los Angeles Angels of Anaheim over the Arizona Diamondbacks on Tuesday at the Big A. The Halos saw their record improve to 40-33, still in third in the American League West. Felix Pena, making his first-ever start for the Angels, worked four innings, yielding just two hits and one earned run. He struck out six batters and walked three. A 5-2 lead by the Angels nearly slipped away in the top of the ninth when the D-backs’ Paul Goldschmidt hit a two-run home run off Blake Parker. Mike Trout, again, was the offensive star. With just one at-bat, he singled and drove in two runs and walked twice. He’s now batting .335. Ian Kinsler and Kole Calhoun each homered for the Angels. The Angels will take on the Toronto Blue Jays on Thursday with Tyler Skaggs (6-4) starting for the home team.